Thursday was a day of recovery for some in the Houston area. For others it was more of the same rescue operations that seem to be never ending. Hurricane Harvey, which made landfall late Friday, has left 37,000 homes heavily damaged and destroyed nearly 7,000 statewide. 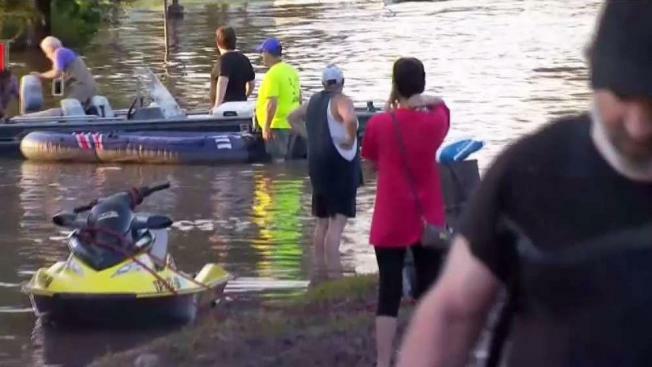 Many in the area were hopeful Thursday the water will soon start to recede as it is starting to in a few other places. In the community of Cypress, Francisco Gonzalez said his living room is under about a foot of water. He is thankful everyone is safe. Gonzalez said his family's ruined furniture now sits in a pile outside their home, an all too common site in Cypress. The town of Wharton, about an hour away from Cypress, was cut off from the rest of the state by flood waters from the Colorado River. The Bay Area's task force of emergency crews is in the area providing aid and beefing up rescue efforts. San Jose Fire Department Battalion Chief Arthur Belton has a team in the area. His crew has a lot of recent experience, including rescuing victims from San Jose's historic floods in February. "There's a lot of hazards we're not able to identify until we're right on top of them -- liked barbed wire, fencing and to sign posts," Belton said.